A contemporary dividing screen like this is a unique addition to any room in the home. 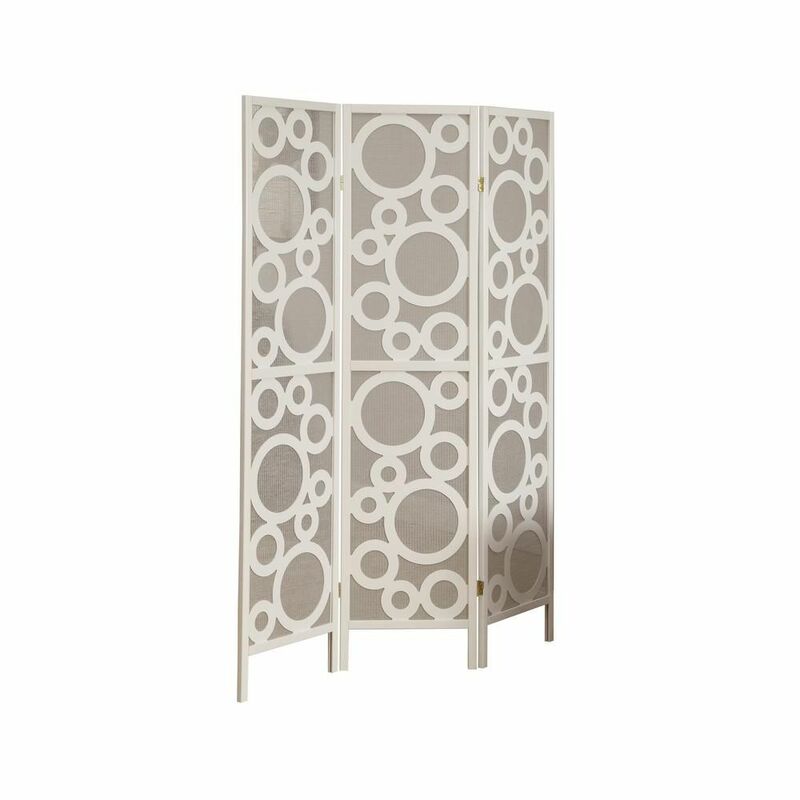 Made with soft white solid wood, this screen features a contemporary circle pattern that feels fun and bubbly. A contemporary dividing screen like this is a unique addition to any room in the home. This screen features a contemporary circle pattern that feels fun and bubbly. At a beautiful touch to your living space with this folding screen. Its elegant cappuccino frame accentuate the circle design and your decor. Place it in your bedroom or living room, as a divider or simple accent piece. It is a definite eye-catcher. A hand constructed screen with gold honeycomb design overlays with a tightly woven rice-paper screen. The tight weave allows little light to pass through as well as reinforces the kiln-dried wood frames, creating a portable and sturdy screen. This four panel folding screen can be used as a room divider to enhance the ambiance and add a touch of flair to your home. With a rich cappuccino coloured solid wood frame covered in a checkerboard woven beige fabric that gently filters the light, along with attachable display shelves for accessories or small decorative objects, this zen design will be an amazing functional accent in a living room, bedroom, or guestroom. Folding Screen - 3 Panel / White Frame " Bubble Design " A contemporary dividing screen like this is a unique addition to any room in the home. Made with soft white solid wood, this screen features a contemporary circle pattern that feels fun and bubbly. Folding Screen - 3 Panel / White Frame " Bubble Design " is rated 4.5 out of 5 by 4. Rated 5 out of 5 by Miki 22 from Just what I wanted I purchased this screen wanting a divider that could give a bit of privacy for overnight guests. I didn't expect anything fancy and it isn't , but the style is nice and simple and it's easy to move. I do have to double it over to get more coverage when lights are on and it is very easy to tip over but most of the time it is near a wall. It does look great with the rest of the furniture and someday I may spray paint the back for more coverage. Rated 4 out of 5 by CHenry from It fits perfectly into the planned space both in size and design. It's lightweight and easily mo... It fits perfectly into the planned space both in size and design. It's lightweight and easily movable. Rated 4 out of 5 by Reddog from The panels look fine. They are pretty flimsy - though... The panels look fine. They are pretty flimsy - though that doesn't matter much given how I am using them. I'd say that they are pretty expensive, on balance.